Cover Image: Volvo Trucks' world-record-setting hybrid Green Machine. Rogan Corporation, a full turnkey contract manufacturer of plastic components and assemblies, specializes in producing injection molded Liquid Silicone Rubber (LSR) components. The company is one of a few select manufacturers that also offers Bondable Liquid Silicone Rubber (Bondable LSR) overmolding that is injection molded directly to plastic or metal parts, creating a single integrated component. Utilizing LSR's heat/chemical/shock/vibration resistance and sound dampening, design opportunities include integral seals and gaskets for waterproofing complex geometries and electronic interconnects, integral membranes, diaphragms, valves, and switch covers. The Defense Advanced Research Projects Agency (DARPA) has recently launched an initiative designed to maintain the viability of air-cooled thermal management solutions and postpone a transition to pumped liquid or refrigeration cooling. By Nelson Gernert, Vice President of Engineering and Technology, Thermacore, Inc.
One week remains before the fourth installment of the IDTechEx European conference on energy harvesting, wireless sensor networks (WSN), and RTLS, taking place in Berlin May 15-16. Dr. Harry Zervos, technology analyst with IDTechEx, interviewed some of the main speakers on their involvement with energy harvesting and wireless sensing and the reasons why their integration is becoming increasingly important in a wide range of applications. 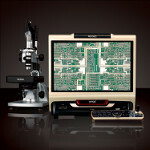 The VHX Series Digital Microscope from Keyence is an all-in-one microscope system that can observe, measure, and record – all within a single system. This equipment combines the capabilities of a conventional stereomicroscope, compound microscope, and metallurgical microscope, and achieves a 0.1x to 5,000x magnification range. 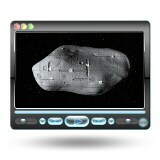 By integrating advanced zoom optics with a CCD camera, 17-in. LCD monitor, light source, controller, and analysis/reporting software, the VHX streamlines testing and improves the speed and efficiency of the inspection process. Ever wish you could see inside, say, a newly cast engine part as easily as they view a 3D CT scan of the human body on one those network-TV hospital shows? Well now you can. 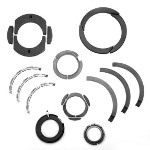 Seal liquids and gases on industrial blowers, pumps, and turbo machinery using custom radial seal ring assemblies, also known as packing rings, manufactured by Metcar. These carbon-graphite radial seal rings meet the most stringent customer specifications. More than 150 grades of proprietary carbon/graphite material are available, and Metcar engineers work with customers to select the optimum grade for specific applications, based on the environment, shaft, housing materials, or rotational speed. Close-clearance and shrink-fitted rings are available. 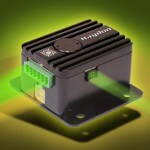 The DCM4826X stepper motor module from Haydon Kerk Motion Solutions is a bipolar, two-phase chopper drive package rated for a 12-48 VDC input voltage and a continuous output current rating of 2.6-A rms (3.68A peak) per phase. The unit is perfect in multi-axis stepper motor applications because less overall mounting real estate is required due to the small size of the drive. The drive can be used with rotary stepper motors or stepper motor-based linear actuators and can be configured for full step, half step, or microstep (1/4, 1/8, 1/16, 1/32, 1/64 step size). 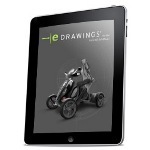 With the new eDrawings for iPad app from 3DS SolidWorks, you can view, share, and collaborate from anywhere with the easy-to-use, email-enabled software trusted by engineers and managers worldwide. eDrawings software is fast, reliable, intuitive, and simple to download, even for non-CAD users. Get it today and let SolidWorks software multiply your possibilities. A vibrating steering wheel is an effective way to keep a driver's eyes safely on the road by providing an additional means to convey directions from a car's navigation system, researchers at Carnegie Mellon University and AT&T Labs have shown – but there are differences between how younger and older drivers respond. Copper composite is the key. Stratasys has announced it will offer bundled, complete 3D printing packages for its Dimension line of printers. The 3D Print Pack includes the 3D printer and everything you need to print parts, including start-up supplies and a support-removal system. Watch this fun animation of a humanoid robot featuring Robolink articulated joint modules from igus® playing chess against itself. Backed by Internet and Hollywood big shots, a new company called Planetary Resources aims to mine precious metals from asteroids in our solar system. There were lots of small stories on this last week, but we felt that the CSM's "Is it really cheaper to mine platinum from an asteroid?" had a solid mix of video and reporting elements.